Cosmopolitan Amsterdam is most famous for its narrow, gabled houses lining the canals. Interesting attractions include the medieval weighhouse, Royal Palace on Dam Square, and New Church. Its most glamorous industry is the diamond trade. Not too far from Amsterdam are the flower centers of Aalsmeer, the picturesque fishing villages of Volendam and Marken, cheese markets at Edam and Gouda, and historic Haarlem, the main center of the bulb-growing industry. Enjoy the city’s sights from a glass-topped sightseeing boat which passes characteristic gabled houses and negotiates picturesque arched bridges. Facing Dam Square, the Royal Palace was built in 1648 and is still officially the royal residence, although the royal family resides in The Hague. The marbled Citizens Hall with inlaid maps of the world is worth seeing. One of Amsterdam’s most visited sites is historic Anne Frank House. Rijksmuseum, the city’s most prestigious museum, houses the largest collection of Dutch paintings in the world. Van Gogh Museum houses a striking collection. A Zuider Zee village that rose to prominence during the golden age of Dutch history, attractive Hoorn is rich in maritime lore; it was from this harbor that early Dutch explorers sailed the world. There are more windmills near Kinderdijk than anywhere else in the world. While in Kinderdijk visitors will want to visit windmill park. It's famous 17th century mill is located in a beautiful green setting, which includes walking paths, and crisscrossing waterways. 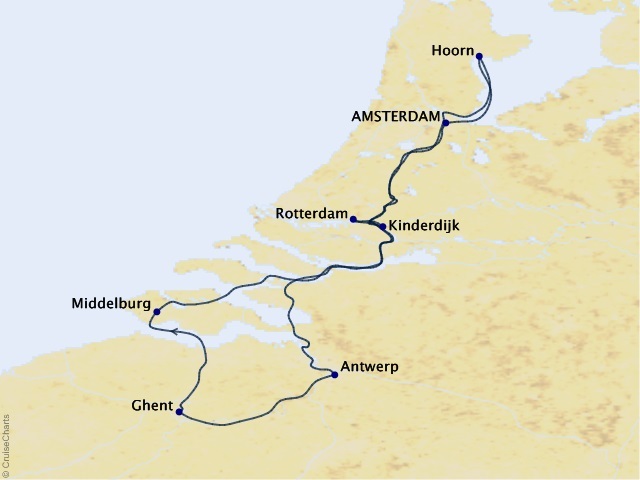 Other attractions include boat excursions from Rotterdam, Canal cruise, and Frisian horse tour. Rotterdam is the Dutch city with a difference. City on the river Maas, number 1 world port. An architectural and cultural metropolis with many attractions, festivals and museums. A vivacous, young urban culture and a superlative selection of shops, restaurants and cafes. Antwerp is famous for its art treasures, diamond industry, and culture, relaxation and entertainment. Shop at Grote Markt, at the heart of which stands Brabo Fountain. Antwerp’s main attractions include stunning City Hall, one of the most important buildings of the Northern Renaissance; Our Lady’s Cathedral, one of the finest gothic churches in Belgium; and the daintily restored 16th-century guildhouses. Visit Diamond Land or Provincial Diamond Museum. Other sights include The Steen - a waterfront gatehouse of a medieval fortress built on site of a 9th-century fortification from which the town spread that now houses the National Maritime Museum; Mayer van den Berg Art Museum; Royal Art Gallery - which has 2,500 paintings spanning five centuries; and Plantin-Moretus Museum - a 16th-century patrician mansion that was a famous printing house of the Plantin and Moretus families. It is no coincidence Ghent was given several names: historic heart of Flanders, a city of all times, one of the most beautiful historic cities in Europe. The city combines an impressive past with a vivid present. The historic heart of the city offers many places of interest. From St Michael's bridge there is a wonderful view of the skyline of Ghent with the three impressive towers of St Nicholas' Church, the Belfry with its bell tower, and St. Bavo's cathedral. Traces of the Middle Ages are well-preserved in Ghent. The old port with its guild halls on Graslei and Korenlei is merely one example of the beautiful views this town has to offer. Not far from Graslei arises the Castle of the Counts, once the medieval fortress of the Count of Flanders. Ghent also has several museums, abbeys, beguinages, dozens of churches and historical buildings. Everyone can find something here to suit his taste. Ghent offers shops, restaurants and an exciting nightlife. Discover Ghent by boat, carriage, bicycle or on foot. Middelburg is the capital of Zeeland and an important market and commercial centre. It is one of the oldest towns in the Netherlands with many associations with the Counts of Holland. At the centre of Middelburg is the 12th century abbey complex, with three churches, two museums, a herb garden and office space for the regional government. Above the Gispport, the entrance to the complex, is a statue of Willem II. The Lange Jan, or octagonal tower, is topped with the imperial crown of Willem II, whose marble tomb is in the church below. The stadhuis was built in the 15th century but required rebuilding after bombing in the Second World War when many buildings were destroyed. On the exterior are 25 statues of counts and countesses of Zeeland. Cruise port, security and handling fees of $175, transfers, airfare, government fees and taxes are additional for all guests.